Wimbledon’s long-standing relationship with IBM has introduced artificial intelligence to a 150-year-old British institution. Wimbledon is as venerable an English institution as you can get (despite the fact that no English player has won since Virginia Wade in 1977). It’s strawberries and Pimms, with hours to engage in that ultimate English pastime – obsessing about the weather. The TV coverage of the tournament has also been traditional, with the BBC the go-to presenter of coverage for decades. But behind the ritual and tradition, Wimbledon has never been afraid of bringing aboard new technology to enhance the experience and running of the tournament, both on-site and in viewers’ homes. In 1990, Wimbledon began a partnership with computing giant IBM. The company came aboard to help handle data. Few then would be able to predict what is now commonplace – that good data is essential for producing good content, especially sports content. And at the Wimbledon Tennis Championship, data is collected on a massive scale. “We have 48 statisticians that we employ who sit around all the different courts. At every match on every court, we collect statistics,” says IBM’s Simon Boyden. Boyden is a digital architect in IBM’s iX group, which focuses on helping businesses deliver innovations through the implementation of IBM tools. The statisticians Boyden employs are actually tennis players – no one competing at the Wimbledon Tournament, obviously, but competent county-level players. Trained to use IBM equipment, between one and three tennis-player statisticians sit on every court, and throughout each match capture every single data point that could be imagined. Approximately 4.8 million data points are captured across the duration of the tournament. Additionally, on-site technology supervisers are in radio contact with all the stats teams and are able to review video. That quality of data is the underpinning of all the services that IBM provides the club. These include services for the media working onsite, allowing broadcasters, commentators and analysts to sift through and explore all the match data that has been collected, including video. All this information is also made available to players and coaches. Analysis of video and the accompanying statistics are a cornerstone of modern sports science. 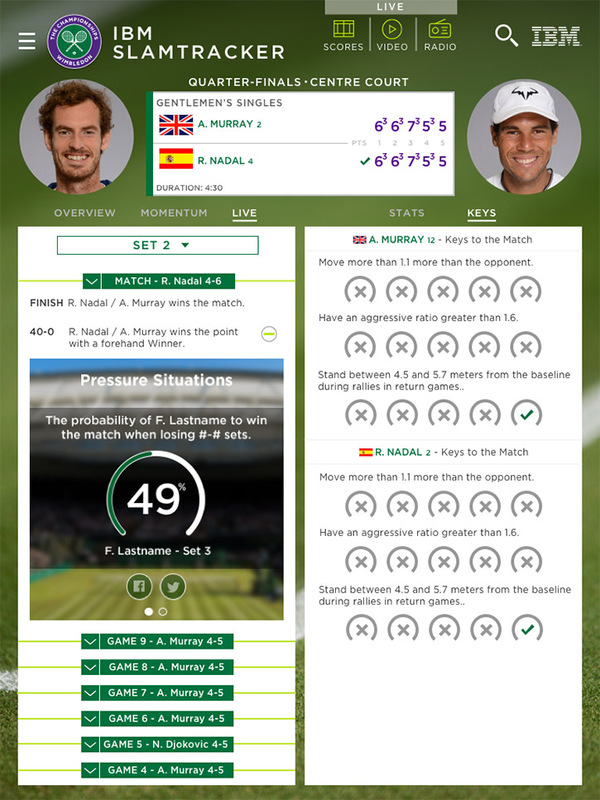 IBM have a data sciences team who often work closely with the media to come up with interesting facts, figures and historical Wimbledon data that can be incorporated into a broadcast. The company also builds Wimbledon’s digital platforms, including the websites, phone apps, Apple TV and, this year, a new Facebook chatbot, which lets fans check in on scores or even find out where to buy strawberries around the Wimbledon venue. Wimbledon has a surprisingly long history with artificial intelligence. The collaboration with IBM began when IBM’s Watson technology was used to gather up and ingest social media mentions around the tournament. Posts were analysed for sentiment – positive or negative – around individual players and the matches. Last year, IBM and Wimbledon rolled out what they call Cognitive Highlights. Wimbledon wanted to create highlights packages out of matches, condensing a three-hour match down to a two-minute video. This was something they had previously done using human video editors who would watch the match, make selections of the interesting moments and then edit together a highlights sequence. “Obviously, that takes someone quite a long time to do,” observes Boyden. “It means you can only do a certain number of matches, and it means that it takes quite a long time after the end of the match to produce that highlights package. Particuarly now with social media, they want to be able to get those clips out as fast as possible after the match. So what we did was, essentially, teach IBM Watson how to get excited about tennis. 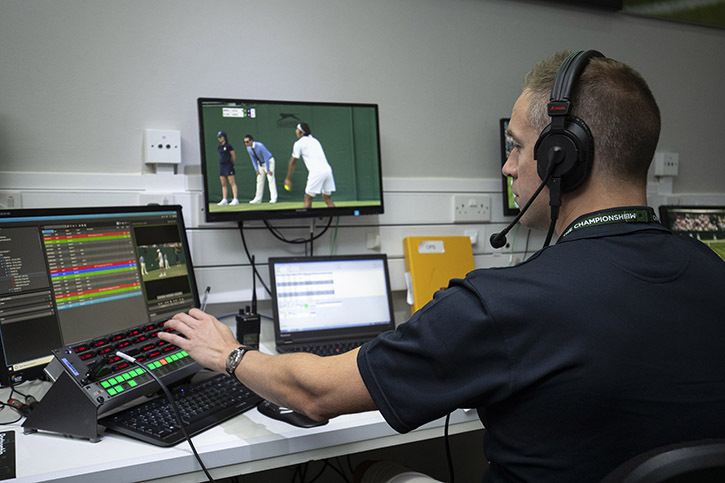 Wimbledon has an agreement with broadcasters that they will keep their in-house video production to one hour of footage per day, so the ability to easily distil a match down to its essentials is a great asset. How does the AI training process actually work? How do you coach an AI? “IBM has some patents around this. We worked quite closely with our research groups to train models around crowd noise. At the highest level it’s the normal training of a neural network-based solution. We give it some examples of what crowd noise is like and examples of other noises in tennis, and we build a model that allows us to send each of those points into an API and it comes back with a rating for the level of crowd noise. We’ve done a similar thing around player gestures. 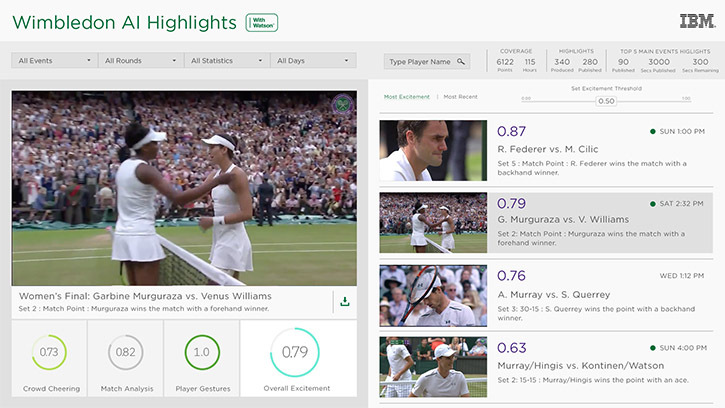 IBM has turned its Wimbledon clip generation AI into a product, which it is adding to its offerings for other sports broadcasts, with implementations around FIFA football, Masters golf and the US Open Tennis Championships already under way. This year marked the 150th year of the Wimbledon tennis tournament. The IBM and Wimbledon teams sat down together at a dinner to brainstorm something that could be a special collaboration to mark the anniversary. 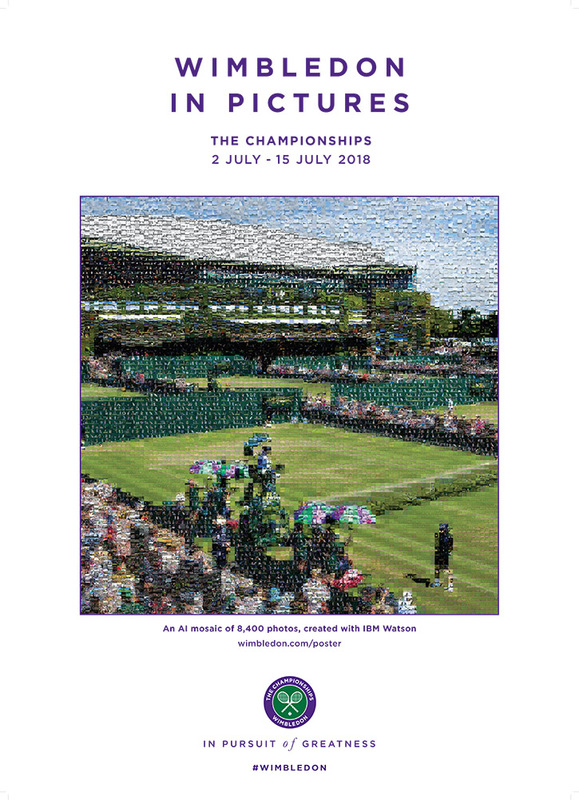 The result was the Wimbledon 150 year anniversary poster, which is a mosaic entirely composed of still images from past Wimbledon championships. This kind of mosaic has been done before – and is almost a cliché. But what made this year’s IBM Watson-produced poster unique was that the objects in the poster’s depiction of the Wimbledon grounds were made up of tiny photographs from the Wimbledon archives of each object.